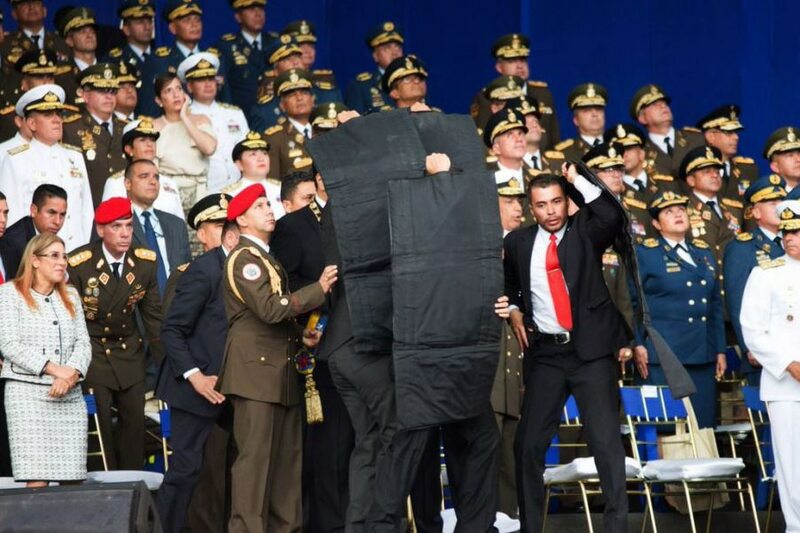 MR Online | Why the attempt to assassinate Maduro? The attempt to assassinate Nicolas Maduro, president of Venezuela, has failed. This news is days-old but the facts are reiterated here starkly. The event raises serious questions for “progressive” critics now in close collaboration with imperialism. 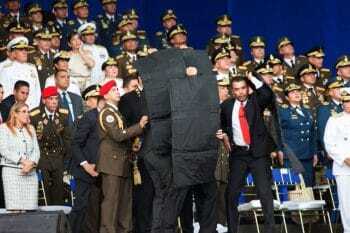 The assassination attempt was made on August 4, 2018, while Maduro was addressing the nation on live TV during a celebration of the 81st-anniversary parade of the National Guard parade in Caracas. They have tried to kill me today, and everything points towards the right-wing forces, the Venezuela ultra-right in alliance with the Colombian ultra-right, and the name of Juan Manuel Santos is behind this assassination attempt. However, Santos recently suggested in public statements that Maduro’s mandate is close to coming to an end. “I hope it is tomorrow even. Colombia would be willing and ready to help in any way possible,” commented Santos on July 30. Some countries—Bolivia, Cuba, El Salvador, India, Iran, Nicaragua, Russia, Spain, Syria, Turkey, Uruguay, and Vietnam—immediately condemned the assassination attempt, and expressed solidarity with the Venezuelan leader. A number of Caribbean island-countries, the regional bloc of ALBA, and international groups—such as the Union of South American Nations, Community of Latin American and Caribbean Nations, and the World Peace Council—also repudiated the attack. The Communist Party of Argentina, the FARC in Colombia, Al Fatah, the Democratic Front for the Liberation of Palestine, the Popular Vanguard and New Nation Parties in Costa Rica, the Guasu Front in Paraguay, the New Movement Party and the Broad Front in Peru, and many other political and social organizations in regions and countries denounced the assassination attempt as well. A few of the rightists even claimed the incident was fabricated. On cue, apologists within the imperialist media also presented a story with a skeptical tone: “Was the attempt staged by Maduro?” Here the link between mainstream media and the right-wing is on full display. While not all of the political leaders who have been assassinated were explicitly anti-imperialist—merely getting in the way of U.S. profits is all that is required—thousands of anti-imperialist fighters have been killed as part of Washington’s centuries-long effort to protect its interests in Latin America. Any leader who chooses the path of self-reliance, of putting the interests of their people first, has become a target of imperialism. Those merely attempting to take small steps to move out of the imperialist orbit have also been targeted. Those at the top of the imperialist hierarchy even have no problem targeting their own assets, allies, and lackeys when they have outworn their usefulness. Many leaders have been overthrown through in coup d’états. Assassination by being shot or killed in some mysterious accident (a few have been blown out in airplanes) has been the preferred method for most of imperial history. However, some newer methods now in vogue include either “forced exile”—most recently in the case of Jean-Bertrand Aristide in Haiti—or ousting by a “democracy movement,” the latter being nothing more than very well-funded marketing campaign. Assassination attempts are made when imperialists fail to find scope for regime change through fabricated political “movements,” which appear democratic but at their core are faithful to imperialism. However, in some cases it is not possible to mobilize social and political forces strong enough to overthrow the targeted political leaders, even with the help of a manufactured crisis (typically through economic strangulation). When these tactics fail assassination becomes a much more likely option. In assassination attempts, imperialism has historically relied on its fabricated political movements—the local political lackeys. These allies range from political parties, disgruntled elements within the targeted government and business unions, to mainstream NGOs focused on various social services. It is a mobilization of social and political forces that—wittingly or not—is faithful to an external master. In Venezuela, rightists are finding it difficult to succeed with their political fight. They are failing miserably to mobilize other social forces, utilize existing pockets of discontent, or provide any sort of inspiration. The situation leads them to terrorist activity, and their increasingly violent tactics have been supported by U.S. and (most) international media without question. Given this context, it should come as no surprise that an assassination attempt has been made. It is an indication of the rightists’ failure in the political fight, as repeated losses fuel ever more desperate tactics. Clearly the situation is charged but politics and political position are not static in any society. It is absurd to expect that the policies of Chávez, and now Maduro, could have been be error-free considering the circumstances. From the history we have of any society attempting to fight the regime of capital, it is clear that the struggle will be long and difficult, especially without the support of a large block of allied countries. Paul Dobson, “Venezuela’s President Maduro Survives Assassination Attack On Live TV,” Venezuela Analysis, August 5, 2018. Paul Dobson, “Venezuela’s Maduro Receives International Solidarity Following Assassination Attempt,” Venezuela Analysis, August 6, 2018. Ricardo Vaz, “Venezuela Assassination Attempt: Maduro Survives but Journalism Doesn’t,” Venezuela Analysis, Aug 7, 2018. “Cuba reiterates unconditional solidarity and support for President Maduro and the Bolivarian Chavista Revolution,” Granma, August 6, 2018. 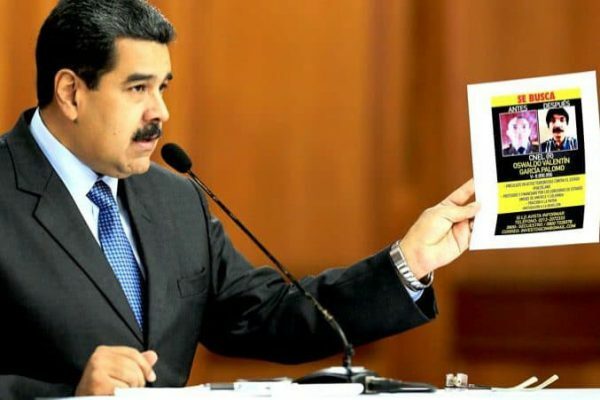 “Powerful Enemy May Be Behind Assassination Attempt on Maduro,” Sputnik International, August 7, 2018.